After a good 10 days without polls, here are two new ones. First of all is yesterday's Justason one. And today we have a new one from Mainstreet. Both polls show the NDP ahead, although its lead is significantly bigger according to Mainstreet. 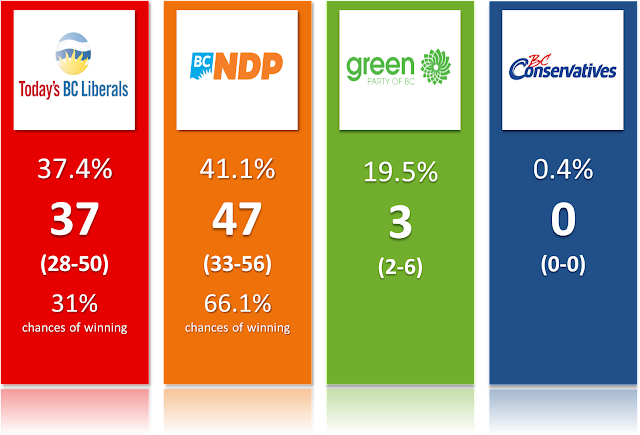 I updated the projections and you can find more details on the BC Election 2017 page (have you bookmarked it already?!). The title used the term "maybe". This is because there are a couple of things to keep in mind before calling for a guaranteed NDP majority. First of all, the Justason poll. Sample size is technically 1128 respondents but a whopping 37.5% either don't know, are not eligible or wouldn't vote. That's almost 40% of the sample! So the numbers they published are among decided voters and there are only 712 of them. The firm then goes on to break down the results by 6 sub regions. That's completely ridiculous. Victoria for instance has a grand total of 60 respondents! Why would a firm even bother publishing numbers based on such ridiculously small sample sizes? That reminds me of this poll during the last federal election that literally had 10 respondents for the CPC in the entire Atlantic Canada. Here's my advice: if your sample is small, don't publish regional breakdown, it's pretty useless. As for the Mainstreet one, while it doesn't suffer from a tiny sample, there are a couple of things that you should know about. First of all, they dropped the BC Conservatives, which makes sense. But because they don't even offer an "other" option, it means that Lib+NDP+Green sum to 100%. Elections in BC usually have a higher share of others than other provinces. We can expect at least 2-3% in this category (included for the 10 BC Cons candidates). I really wish Mainstreet would offer "other party" as a choice. Secondly, Mainstreet is showing a really important swing in favour of the BC NDP (+5 points) and against the Liberals (-3). Is it really what is happening? Is the strategy of John Horgan to pretty much stay in the greater Vancouver paying off? Mainstreet sure indicates so since the NDP is now ahead by 16 points in this region. But is the swing real or is it simply the results of random sampling? Justason (with tiny samples) has the NDP barely ahead in the same region. 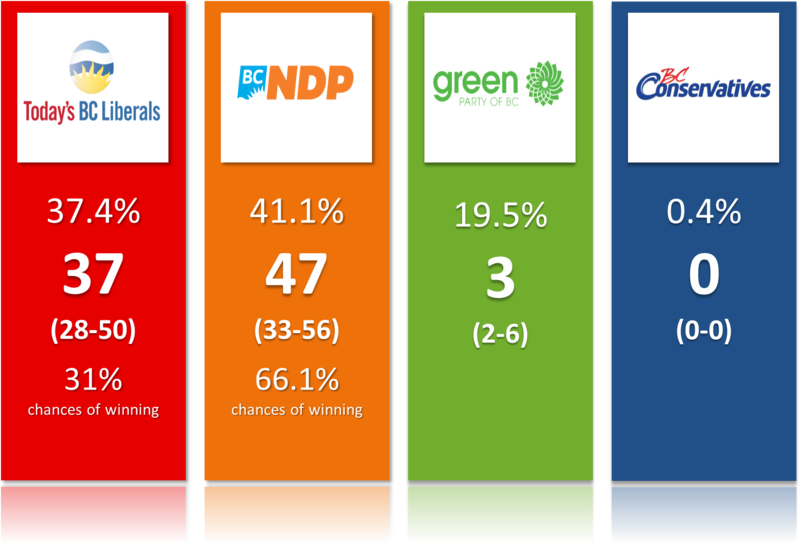 Also, the number of undecided actually increased since the last poll (especially in the rest of BC). That doesn't make any sense, we shouldn't see more undecided after 2 weeks of campaign. Finally, the second choices of the Liberals have massively shifted from having the Green as the main second choice to the NDP. I personally think this might be the result of a small sub-sample there (it's only for non-decided but leaning Lib voters). Anyway, both polls have been added to the average. Thank god for the Justason one otherwise my poll average would now simply be based on Mainstreet (since all the other polls are getting old) (Note: I have nothing against Mainstreet, on the contrary, but I don't like it when my average is driven too much by only one firm or poll). My projections have changed quite a bit. I personally don't like when they changed drastically overnight but there isn't much I can do with with so few polls. What was a close race between NDP and Liberals is now turning into a comfortable lead for the former. Comfortable being maybe an overstatement. With 31% chances of winning the most seats, Christy Clark is still in this race but her odds are decreasing. The Green party (that revealed its full platform yesterday) is definitely sticking around. We are at the halfway mark of this campaign and their support appears to be solid. Mainstreet even shows a big increase in the number of "strong supporters" of this party (at 67% of strong supporters, this party is barely behind the other two). But the electoral system is still hurting this party quite hard. If we had a PR system, Andrew Weaver would be on his way to get around 17 MLAs instead of the 3 projected here. To be fair, the simulations indicate that the Green could elect as many as 11 people but this is obviously an unlikely crazy perfect case scenario. They do have, however, around a 25% chance of getting 5 MLAs or more. But to do so, they will either need to beat their poll numbers or, more likely actually, rely on strong local campaigns and candidates. As a final note, people naturally haven't forgotten about how wrong the polls were in 2013. And it's too early to look at these polls -especially the Mainstreet one - and declare a NDP victory. But the big difference so far is that the BC Liberals don't appear to be climbing back during the campaign as they did four years ago. To be fair, they also didn't start as low as they did. Still, I'm not saying we are immune against another polling error, but the dynamic is at least different. Now, the next big event is naturally the debate on Wednesday. Hopefully we'll get some polls asking who won.